Adults are 2.5 mm (1/10 inch) long. The body is very flat and is well adapted for crawling into cracks and crevices. They are very easily identified. The margins of the thorax are saw-like and posses six projections on each side. In addition, there are three longitudinal ridges on the top surface of the thorax. A tooth on the femur of the hind leg separates the male from the female. Wings are well developed but there is no record of this insect flying. A related species, the merchant grain beetle (0. mercator (Fauvel)), can fly and is more often found in warmer climates. To separate these two beetles, you need to examine the head for a small projection behind the eyes. On sawtoothed grain beetles the projections are curved and wide, whereas on the merchant grain beetle the projections are pointed and narrow. 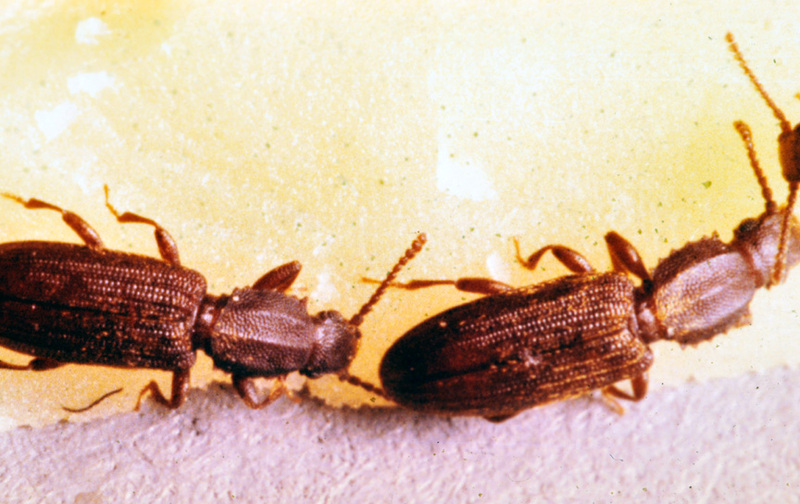 Sawtoothed grain beetle larvae are a yellowish white except for their head, which is brown. Full-grown larvae are less than 3 mm (1/8 inch). Eggs are deposited singly or in small masses in the food. They may either be laid in crevices or freely. The number of eggs averages 375 per female. Eggs hatch in 3-5 days. Within a few hours of hatching, larvae begin to feed. There are 2-5 (usually 3) larval instars. In preparation for pupation, the larva attaches itself to a fixed object. The pupa is formed in a crude cell made of food particles. 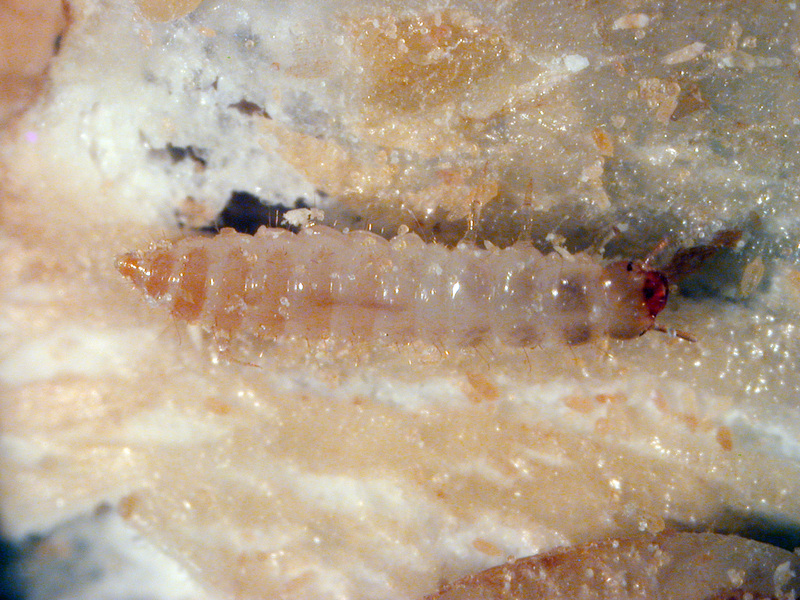 The larval exoskeleton is shed but remains attached in the pupal cell. The pupa has the same six projections on each side of the thorax. Development time from egg to adult under optimum conditions can occur in about 25 days. Adults and larvae are somewhat resistant to cold temperatures, withstanding 3 week exposure to 0˚C (32˚F). Lethal temperatures for all stages are in the range of –15.6˚C (4˚F) for an exposure time of 24 hours. Upper limits of temperature for development lie somewhere between 37.5˚ and 40˚C (99.5-104˚F), while the optimum temperature is about 30-35˚C (86-95˚F). Eggs hatch in approximately 3-5 days, the average larval period lasts 12-15 days, and the pupation time is 4-5 days. Oviposition usually begins during the first week of adult life and reaches a maximum during the second or third week. After 10 weeks, the oviposition rate declines rapidly. Average adult lifespan of mated females range from 4-19 weeks; however some females have been known to live for more than 7 months. Adults are generally very active and tend to migrate from the food source when populations become too large. 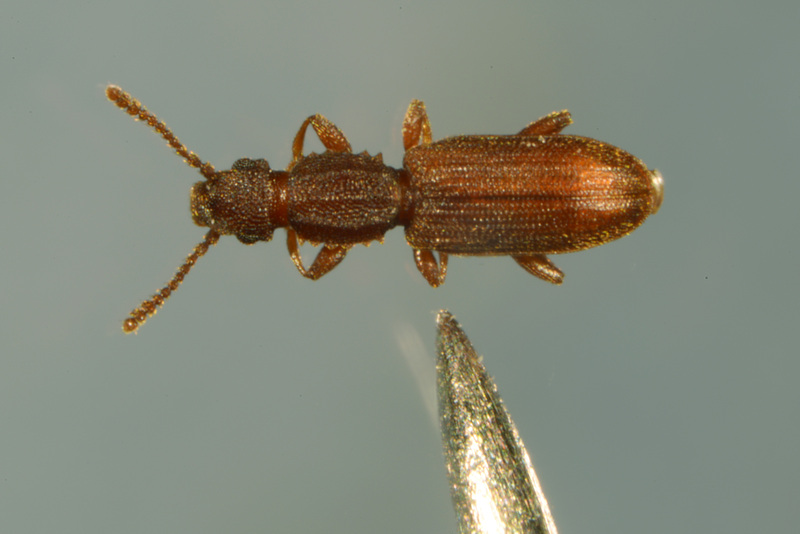 This beetle can be found feeding on cereals, dried fruit, bran, rolled oats, brown rice, walnuts, breakfast foods, macaroni, sugar, drugs, fried meats, chocolate, tobacco, and snuff. It cannot attack perfectly sound grain, but can feed on slightly damaged grain. Thus, it is often found in whole grain in association with other insects. It has been observed feeding on eggs and dead adults of stored-product moths.